Spending the night at the hospital with your sick child is exhausting – both physically and mentally. 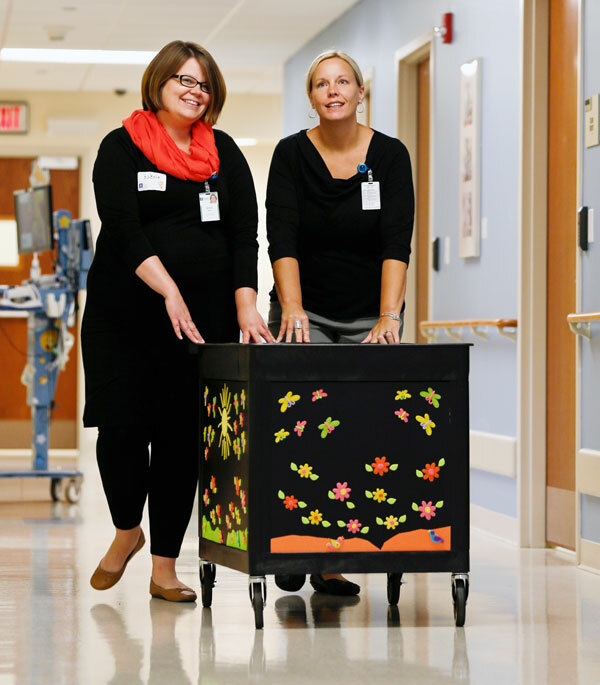 As a member of the Parent Advisory Council (PAC), we wanted to find a way to connect with parents whose children are patients at Akron Children’s Hospital Mahoning Valley. We decided that something as simple as a coffee and snack could make a difference after a long night in the hospital. We hoped that our kind words and a little treat could help brighten the day of parents who are going through a difficult time. So, this summer we started the Parent Courtesy Cart on the Beeghly campus. Volunteers from the PAC visit the pediatric floor and special care nursery with juice, coffee, and snacks for the families. Meeting parents and patient families has been a wonderful experience. Often parents have not yet had the chance to eat or drink since arriving at the hospital. Some parents apologize to us because they have been in the same clothes for days. Anyone who has had a child hospitalized can relate to these parents. One patient that stands out was a teenage girl who was with her parents. We knocked on her door and asked her parents if they would like something to eat or drink, she quickly encouraged her mom and dad to grab something. She proceeded to let us know she was not looking as good as she usually does. She was thankful that we had thought of her parents and her wonderful attitude was contagious. The Parent Courtesy Cart has also helped us cross language barriers. A stay in the hospital for families whose first language is not English must be exceptionally difficult. These families have been extremely appreciative and kind. We are able to provide a small comfort to parents who are going through what must be a very scary time with the Parent Courtesy Cart. We hope that by helping parents, we are contributing to the family-centered care that Akron Children’s Hospital is dedicated to.